A few weeks back Conor O'Mahoney took to his blog to dig under the covers of an Oracle "Database Performance" ad that they were re-running. 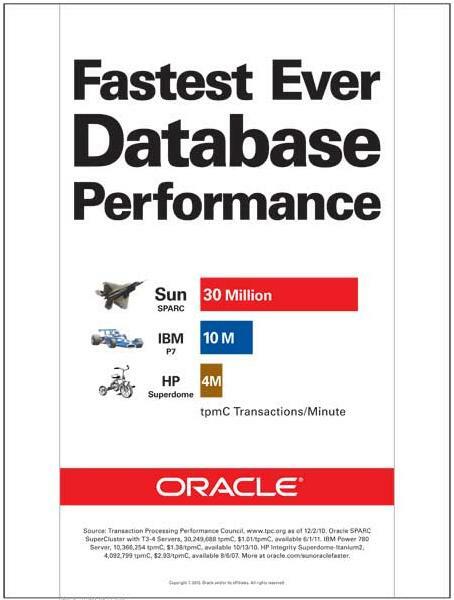 Because this advertisement is based on an industry benchmark that shows that Oracle uses 9 times the number of CPU cores to achieve only 3 times the performance of the IBM result. To put it another way, if you look at the per-core throughput, the IBM system is 3 times faster than the Oracle system. Oracle highlight the overall throughput of the system, but if you do some investigating you will see that the Oracle system in question uses 1,728 CPU cores, whereas the IBM system in question uses only 192 CPU cores. Considering that you typically pay for software based upon the number of CPU cores, I know which system I’d prefer to be buying software for.